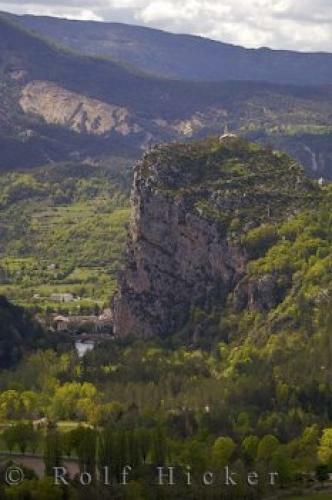 The view from the Verdon Gorge chapel, Notre Dame du Roc is spectacular, high above the town of Castellane in the Alpes de Haute region of Provence, France. Roc in the Verdon Gorge in Provence, France. ... The terrace of Notre Dame du Roc is a great viewpoint to look down on the town of Castellane, the Napoleon Bridge and the Verdon Gorge scenery. Notre Dame du Roc chapel was built on the site of the Roman fort but there are still ruins of Petra Castellana to be seen. The first record of Petra Castellana was in 965, before that the settlement was called Salinae supposedly due to salt-water springs in the vicinity.Castellane in Provence, France is a pleasant little town with a Saturday morning market, narrow streets and the Place marcel-Sauvaire edged with delightful arcades.Notre Dame du Roc Chapel in the town of Castellane, Alpes de Haute, Provence, France, Europe. I photographed this photo with the digital SLR camera model Canon EOS-1Ds Mark II, aperture of f/5.6, exposure time of 1/160 sec. on ISO 100, as always I used a original Canon Lens, the focus lenght for this picture was 180mm.